Adult learners who battled against the odds, against self-doubt and previous bad experiences to return to education were honoured at the Adult Learners’ Week (ALW) awards. The award winners and nominees, who ranged in age from 19 to 85, as well as the tutors, projects and employers who helped them get there, received their awards at an uplifting ceremony near London’s Trafalgar Square on Monday (June 15). Also in attendance were senior figures from the Skills Funding Agency, Association of Colleges, Association of Employment and Learning Providers, Find a Future, colleges and independent learning providers among others. 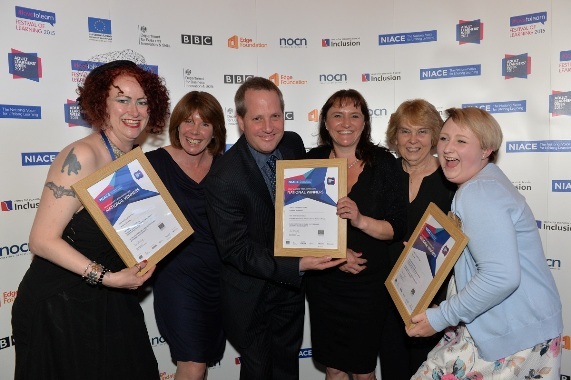 The awards came as part of ALW — seven days of events, activities and campaigns to celebrate and raise awareness of lifelong learning, organised by the National Institute of Adult Continuing Education (Niace). 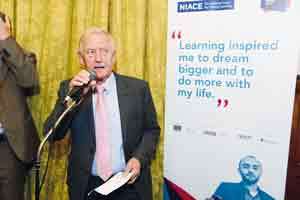 David Hughes (pictured below), Niace chief executive, said: “Awards like this are very special. It’s an emotional evening, because some of those winners are just amazing and it’s just sometimes important in our society to say ‘let’s celebrate people who have never really been recognised before’. The outstanding individual award winner was Lee Hughes, aged 30 and from Barnsley, who left school with no qualifications and fell into drug addiction. But after kicking his habit and studying an Access to HE diploma at Northern College, he is now reading modern history at Sheffield Hallam Unviersity. Lee said he felt the awards were important to inspire other learners. “It’s championing further adult education, so the people who win awards can go out and share their experiences,” he said. Winner of the newly-introduced patron’s award, chosen by Niace patron HRH Princess Anne, Adele Tilley, aged 26 and from Leicester, agreed. “I think it spurs people on and it shows people around you that you can achieve what you want to achieve,” she said. Adele grew up in care, which had a huge impact on her schooling, and didn’t return to learning until she was 21, having escaped an abusive relationship. She completed GCSEs in maths, English and ICT, went on to do an access diploma in business management and is now working to gain a master’s degree at De Montfort University. “Starting out was the hardest challenge, taking that first step,” she said. “After that, everything else gets easier, as your knowledge grows so does your confidence. “I feel totally honoured and elated at the minute — to have won the award is an amazing experience for me. However, amid the celebrations there was a sombre note – with more and more chunks being taken from the Adult Skills Budget as part of the austerity cuts, Mr Hughes said he was concerned the that opportunities which this year’s award winners had grasped would not be available in the future. “We’ve got a real fight on to make sure there’s public investment to help people who didn’t get a chance the first time round to have another go,” he said. ALW, which ran from June 13 to 19, also saw taster courses and have-a-go sessions up and down the country, offering people the chance to try their hands at hundreds of different skills, from refereeing, circus performing and ukulele to online safety, rocket building and digital photography. In the spirit of ALW Labour MP Barry Sheerman (pictured right) called for Skills Minister Nick Boles to be sent back to the classroom. Mr Sheerman made the comments at the House of Commons ALW reception on Tuesday (June 16). 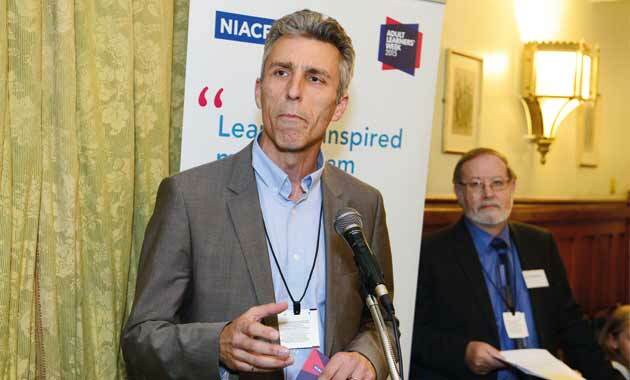 “We have got to fight back, positively, creatively [against funding cuts],” he said. Lee Hughes, who picked up this year’s outstanding individual ALW award, also spoke at the event, praising his college, Northern College, but said he was “baffled” by the funding cuts, which he described as “counterproductive and wrong”. “Compare my meagre education to those in power now,” he said.